After years of struggle in one of the most premium and important smartphone market in the world, USA, Nokia is finally seeing its smartphone strategy and hard work bearing fruits. During Q3 2013, Nokia became the fourth largest smartphone brand capturing a record high 4% market share in a market which is a virtual duopoly dominated by Apple & Samsung. According to our Market Monitor service, Apple & Samsung were in neck and neck capturing 33% market share each and together controlling almost two-thirds of the smartphone shipments during the pre-holiday season quarter. However, Apple led the market shipping slightly more iPhones than Samsung’s Galaxy range helped by the portfolio refresh with new iPhone 5s & 5c in September. iPhone 5s immediately became the best selling smartphone model in September . 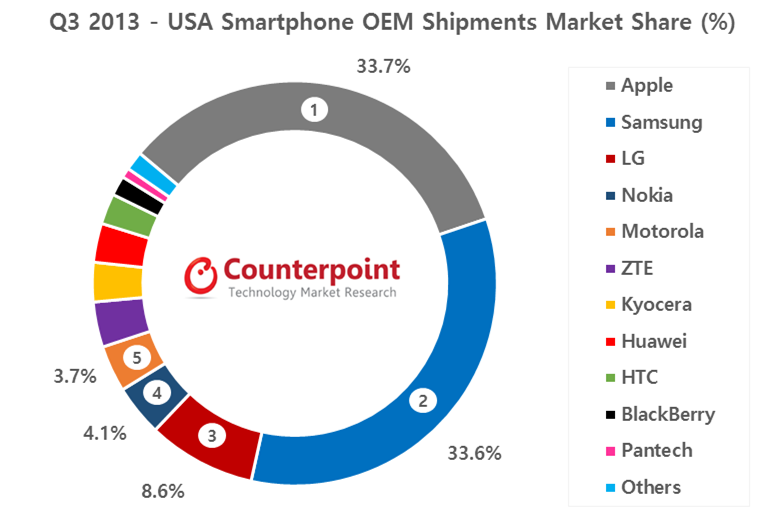 Meanwhile, LG maintained the third spot but saw its share dip slightly to 9% from 10% in Q2 2013.
to note, Nokia now has five Lumia models at AT&T and will add more (e.g. Lumia 1520), two models at Verizon Wireless, three models at T-Mobile and one model each at prepaid carriers – MetroPCS and Aio Wireless. Thus after a long time Nokia’s product portfolio looks broader,deeper and highly differentiated built by leveraging its head-turning design expertise, engineering experience, imaging, location, media assets along with Microsoft’s Windows Phone platform, services and support. Neil is a sought-after frequently-quoted Industry Analyst with a wide spectrum of rich multifunctional experience. He is a knowledgeable, adept, and accomplished strategist. 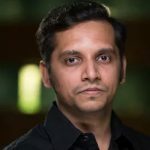 In the last 11 years he has offered expert strategic advice that has been highly regarded across different industries especially in telecom. Prior to Counterpoint, Neil worked at Strategy Analytics as a Senior Analyst (Telecom). Neil also had an opportunity to work with Philips Electronics in multiple roles. He is also an IEEE Certified Wireless Professional with a Master of Science (Telecommunications & Business) from the University of Maryland, College Park, USA.